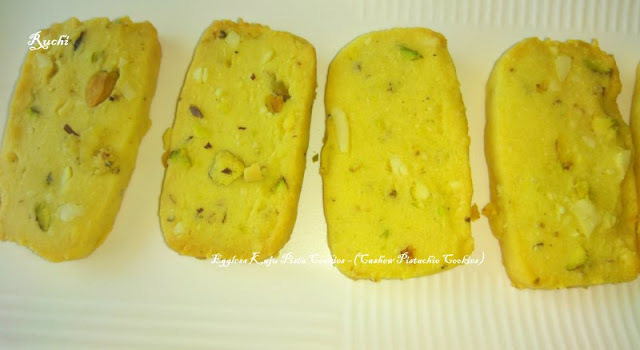 Eggless Kaju Pista Cookies is a delicious snack recipe made with flour, kaju and pista. Kaju Pista Cookies are one of the popular cookies in India. It is famous for the crispy texture. 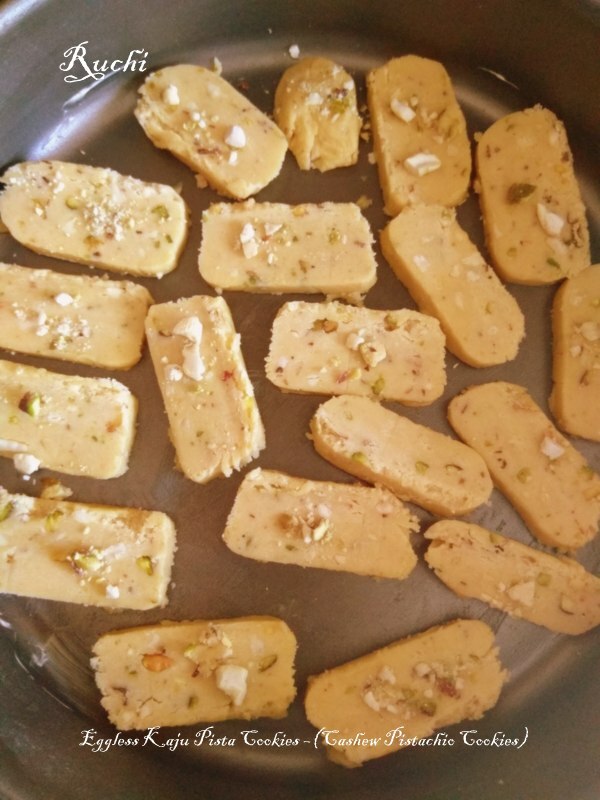 These scrumptious cookies prepared with pistachios, cashews and flavored with cardamom powder makes a good option with a cup of chai and Perfect for picnic, high tea and kitty parties, this easy snack recipe is loved by kids also perfect for giving as gift! Try it. I made it in huge amt for my daughter family. Everyone loved it! I followed her recipe as it is. 2.Take melted butter into a big mixing bowl. Add powdered sugar into the butter and whisk it continuously until the mixture turns even and fluffy. Then add both essence and mix well. 3. After that, add cashew powder, green cardamom powder, all purpose flour and baking powder. 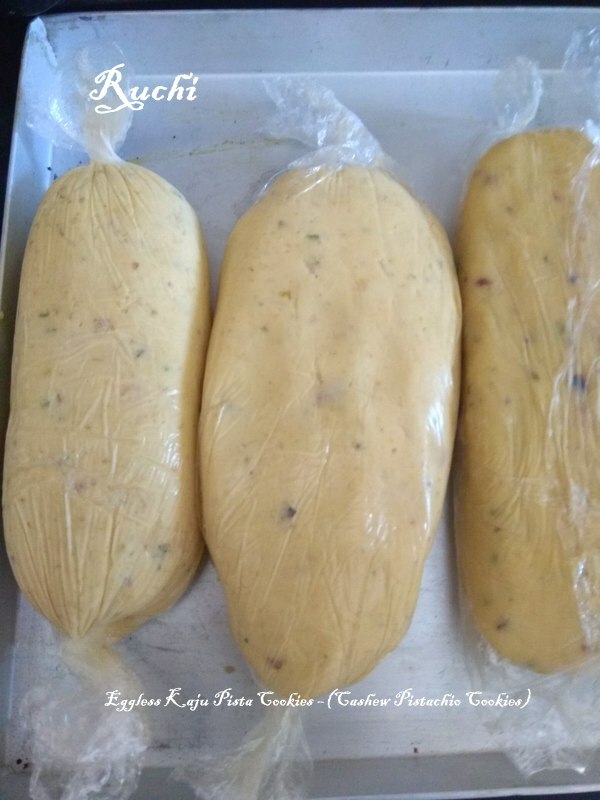 Knead the dough by adding milk in small portions. 6.Take out the logs after 2 hours and cut the cookies into 2 inches gap. 7.Place the cookies on baking tray and bake for 12 to 15 minutes at 180 degree celcious. 8.Cool it for atleast 15 minutes and Transfer the cookies on a serving plate. Amma pls tell me how to prepare urai marundhu for baby.. am a mother of 3 month old baby.. will be moving to saudi by this month end. So pls tell me how to prepare. So that i can take it there. Thank u ma.